Attention choral singers from across New England: Sing That Thing! is returning for Season 4! Don’t miss the opportunity to experience the excitement of a professional television production and to be seen throughout New England by an audience of thousands. Registration is open until November 20, 2017 to high school, college, and adult singing groups from Maine, New Hampshire, Vermont, Connecticut, Rhode Island, and Massachusetts. 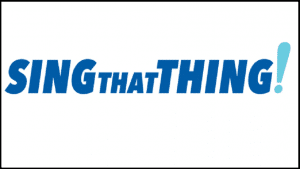 Registration is free at singthatthing.org. Questions can be emailed to singthatthing@wgbh.org. From among the registrants, Sing That Thing! will choose up to 24 groups (eight adult, eight college, and eight high school) to come to STT‘s studios and perform before cameras. Tapings will take place at WGBH Studios in Boston in February 2018. The taping days for ROUND #1 are Friday, February 9, 2018; Saturday, February 10, 2018; and Sunday, February 11, 2018. Friday tapings start at 4 p.m. and end around 10:30 p.m. Saturday and Sunday tapings start at 8 a.m. and end around 6 p.m.
Each of the selected 24 singing groups will be assigned a three-hour block on one of the three days listed above that will include warm-ups, interviews, and performance in front of the television cameras. Each group should come prepared to perform two minutes of music. The taping day for ROUND #2 is Monday, February 12, 2018. The back-up day is Tuesday, February 13, 2018. Tapings start around 4 p.m. and end around 10:30 p.m.
Six groups (two adult, two college, and two high school) will advance to Round #2. Three category winners will be selected (one adult, one college, and one high school). In order to participate in the series, each group must make itself available to participate in each of the designated taping dates for the two rounds.